The following is an update of our original web page posted in 2002. The original page, archived below, remains a good description of the role of maps in finding your way in the backcountry. However, the production and distribution of useful topographic maps has evolved dramatically in the past eight years. New options have become available. Here is the rest of the story. All topographic maps published in the United States are based on the (only) complete Federal Government aerial photographic land survey (done in the 1960s), which resulted in the 7.5 Minute Quadrangle map series of 57,000 paper maps covering all fifty states. The 7.5 Minute Quad topo maps of Oregon total more than 1,900 sheets. In the recent past, in large wooden cases, map and blueprint stores carried the complete set for their State and perhaps popular maps for nearby States. The United States Geographic Survey carried a complete inventory of all USGS topo maps at centers across the nation. Outdoor stores once carried the more popular maps for hunting, hiking and other adventures. Individual entrepreneurs such as Al Cardwell, owner of "Geographics" in Oregon, use the free USGS computer data base to produce a series of convenient maps of popular recreation areas such as the "Three Sisters Wilderness" in Oregon. This Geographics map combines corners of three or four Quad maps onto one conveniently folded sheet at almost the same 1:24,000 scale as the Quads. The reverse side of the paper Geographics map has a larger scale map "socialized" to provide information about trail heads and other amenities. These maps should be in everyone's car or pack, but they do not replace the grid lines and detail of the original 1:24,000 USGS Quads on which they are based. Green Trails Maps, based in Seattle, WA, now produce custom maps based on the USGS Quad computer data base. Green Trails prints good topo maps of popular hiking areas and sells them at outfitters such as REI for about the same prices as individual Quad topo maps. Green Trails installed kiosks in retail outlets that allow the user to join several Quads, chose the UTM grid and print very useful 12 x 17 inch paper maps, but they were not newbie friendly and required a lot of retail time. They have disappeared since the advent of hard times. Mountain bikers, skiers, hunters and fly-fishers have their own specialized maps published by entrepreneurs. They provide a service because they concentrate on the trails for, say wilderness lakes. Makers can adjust the scale to cover parts of several Quad maps on a single convenient sheet. They contain up to date data which is not found on the Quad maps. However, these private maps do not provide the detail, accuracy, grid lines and other information needed by today's informed backcountry navigator. None of the private maps that I have seen are GPS friendly! Most users do not know what they are missing because they do not know that the UTM Grid can be used to locate a hand held GPS position within a few meters (4.1 average) by eye alone. Most people do not understand the value of finding exactly where they are on a detailed topo map. You cannot find your way back if you do not know where you are! The most useful grid in modern land navigation is the Universal Transverse Mercator Grid (the "UTM" grid). The "UTM" Grid is imprinted (or can be user completed with pencil and yardstick) on all USGS Quad Maps, enabling one to pinpoint and communicate easily, a location accurately to a few yards. The map is divided into one kilometer square boxes, easy to divide into tenths, even by eye. The GPS receiver will give you your location in UTM Coordinates, of little use if you do not have a map imprinted with the UTM Grid. The 1:24,000 USGS Quads are based on NAD 27 Datum. You must select UTM Coordinates and NAD 27 Datum (and True North) from the options on your own GPS Receiver. More and more people are finding that buying a simple $99.00 computer program such as My TOPO's Terrain Navigator or National Geographic's TOPO that are very helpful in planning adventures and storing the details of past adventures. Both computer programs contain all of the 1:24,000 USGS Quad maps and other scaled topo maps for each particular State. GPS receivers are sold with a base map, say of the United States. The installed map software covers major roads (suitable for Motor Home travel), nationwide. Most newer GPS receivers have the ability to download and store more detailed topographic maps. Garmin markets a proprietary program called Garmin Map Source for instillation on your computer. You can easily download topo map sections to your GPS to enhance the detail over the basic map set for the fifty states. Map Source provides the ability to store Waypoints and Tracks from your GPS and from the maps on the computer program as well. Garmin GPS Receivers must be loaded with their proprietary $99.00 Garmin Map Source program using 1:100,000 scale maps. (This program must be purchased in addition to the cost of the GPS.) These maps do not appear to have the actual detail of the USGS 1:100,000 series. You need paper topo maps to find your way in the backcountry! The $99.00 box of National Geographic TOPO maps for the State of Oregon alone has 8 CD data disks containing all of the 1,900 1:24,000 Quad maps and related 1:100,000 topo maps. The $99.00 Garmin MapSource 1: 100,000 scale program for the ten western states is on one CD! In the Fall of 2010, Garmin offered up-loadable 1:24,000 Topo maps, say of the Ten Western States, for about $130.00. These maps are advertised by Garmin as "comparable to" the USGS Quad topo maps but they seem to have less detail and appear to be the 1:100,000 scale maps with extra terrain lines added. Zooming in for the summit of say, South Sister, near Bend, results in the small GPS screen being overwhelmed with brown lines that do not seem to scale thinner. I originally decided to not use the new program, (be careful for what you wish for) but continue to use the 1:100,000 scale maps on my GPS and carry my Quad, Green Trails or Terrain Navigator paper maps. However, I now use the Garmin 1:24,000 TOPO US 24K West with the Map Source program in my Garmin eTrex Venture HC and I have learned to cope with the fact that the terrain lines are sometimes bulky on the small screen. This Garmin model does not have added chip memory, but the on-board memory is enough to cover the entire Three Sisters Wilderness and more. And it is easy to change coverage to another area in a minute at my computer for different adventures, say in the Eastern Oregon high desert. Read the next paragraph. Most map-enabled GPS receivers can be loaded only with a small geographic area, say the Oregon Cascades. More expensive GPS models have the option to add an SD data chip (at extra cost) so that more of a state can be loaded, but most users only recreate in areas that can be loaded on the basic map enabled GPS. (Motor home travelers may need more area but there are other options for them including a laptop computer plugged into the cigarette lighter.) Avid Geocachers use palm pilots and other mini portables. In short, just use a Garmin eTrex H ($99.00) or better yet, a Garmin eTrex Venture HC ($140.00) GPS and have a paper 1:24.000 topo map in your pocket (with a base plate, declination adjusted, $25.00 Suunto M3D Leader compass, of course). This paper map was created and printed at my desk in about ten minutes using My TOPO's $99 Terrain Navigator software covering all of the more than 1,900 USGS topo maps for the State of Oregon. 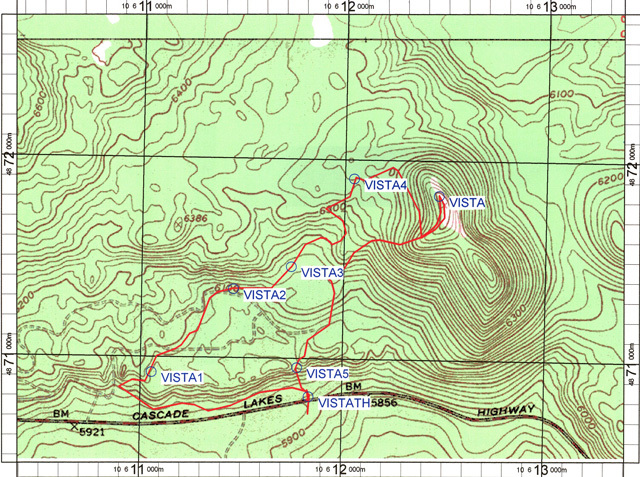 The original 8.5 by 11 map I carried on this adventure had the UTM grid and only the Waypoints for the Vista Butte Trail Head on Cascade Lakes Highway and for the summit of Vista Butte. I saved my additional GPS Waypoints on the way up the snow-shoe trail and saved the Track with my Garmin eTrex, then downloaded the Waypoints and Track to my computer program. (I cleared the GPS memory after the download). I renamed the Waypoints with my computer. The GPS we used enabled us to make a new "cross country" track confidently, back to the car. Note where I made a pit stop on the south side of the Highway (behind a tree, of course). When I climb up Vista Butte again, I will simply download the grouped "Vista" Waypoints and Vista Track to my cleared GPS and print a new map in about 10 minutes, put the map in a baggie in my pocket with the GPS and head for the freedom of the hills. The original story about topo maps is archived below. Copyright©, 2010-2011 by Robert Speik. All Rights Reserved. And judging by the number of maps for the area, Central Oregon offers plenty of just that. But trying to pick out something like the "Top Five Maps of Central Oregon" is a lot like trying to pick out the two best golf clubs in a 14-club set. Like golf clubs, individual maps are created for specific purposes. It's tough to rank them in importance. Still, not all maps are created equal. They come in different scales, some showing great masses of land with little detail and others showing tiny areas with great detail, including topography. Some maps have the Universal Transverse Mercator (UTM) Grid that is designed to be used today with small hand held receivers for the global positioning system (GPS). Some maps don't provide much backcountry detail but are invaluable as an introduction to the highlights of a given area. For picking out some top maps for Central Oregon, it's best to start with the big picture, and then work down to more detailed maps. "What we're trying to do is make a detailed road map in which you can easily visualize where you are, where you're headed and what the lay of the land is," says Stuart Allan of Allan Cartography in Medford, which is putting out a new edition of "Oregon Road & Recreation Atlas" in early May. "It's not super detailed; you don't take it hiking." Going to a smaller scale are a pair of maps that can come in handy: the Deschutes and Ochoco national forest maps, $6 apiece, have a 1:126,720 scale. These are not the maps to take if you're wondering far from your vehicle, but they do a good job of pointing out the area's highlights, such as campgrounds, trailheads and notable features. "The Deschutes map really is, from my perspective, a map that gets you introduced to the area, and perhaps whets one's appetite on what might be out there," says Bill Queen of the Deschutes National Forest, noting the map was updated in 2000. "But I wouldn't just take the Deschutes National Forest map with me as my sole source. It has a large variety of information on it, but it's not a map that you want to pick up and travel cross country from point A to point B because it doesn't have any contour lines on it. But it's certainly the best overall map that shows a wide variety of recreation opportunities available on the forest." The Deschutes National Forest has four ranger district maps … Bend, Fort Rock, Crescent and Sisters … that are incredibly detailed road map originally designed to be used by forest fire fighters to plot strategy. These maps are available at the Bend/Fort Rock Ranger District office on Highway 97 in Red Oak Square in Bend or the Deschutes National Forest Supervisor's Office on Highway 20 near Pilot Butte in Bend for $3 apiece. Those maps increase to $4 on March 1. Because of their size, these ranger district maps are somewhat unwieldy and nearly impossible to open inside a vehicle. The Bureau of Land Management, sometime this summer, is planning to come out with a map of the lower Deschutes and John Day rivers. That map will replace the now outdated and out of print Central Oregon Public Lands map. "The land status has changed significantly over the last few years with land exchanges," said John Hanf of the BLM's Prineville District. "We had folks buying those maps and having problems because they were accessing what was shown as public land on the map which wasn't." The BLM opted not to put out a map for the entire district this summer. What's not covered on the new map is already available in the Deschutes, Ochoco and Malheur national forest maps, Hanf noted. Two companies put out detailed county maps for Central Oregon: Pittmon and Metzger. These maps … ranging from $3 to $5 … don't have contour lines but show roads in great detail, though recently built roads might not show up. "There are so many changes in this area that they can't keep up," notes Fishback. That's about it for maps to use while in your vehicle. If you're heading into the country on foot, you're going to want a map with contour lines and, if you plan on using a GPS, a map with the UTM Grid. With a small GPS receiver and a topographic map with the UTM grid, you can pinpoint your location to within a few feet. A GPS unit will give you two numbers that can be found on the edges of the map. Where lines emanating from those two numbers intersect on the map is where you are. “It’s as simple as finding the intersection of Highway 20 and 27th Street”, says Speik. One of the most popular backcountry maps for the region is the Three Sisters Wilderness map by GeoGraphics. It has a 1:26,966 scale and the UTM grid marks, plus all the popular trails. Geo-Graphics also makes detailed maps for most of the other wilderness areas in the state. The next step is the United States Geological Survey topographic maps at 1:24,000 scale, often called "quad maps," which can make traveling in the backcountry not only safer but more fun by seeing all the detail of the surrounding area. For comparison, the typical Oregon road map in the glove compartment is usually at a 1:500,000 scale. To fit Oregon on a 1:24,000 scale takes about 1,900 maps the size of a state road map. In fact, the entire conterminous 48 states, Hawaii and territories are covered by these USGS topographic 1:24,000 maps, numbering about 57,000 in all. For Alaska, maps on this scale are available for areas around Anchorage, Fairbanks and Prudhoe Bay and at larger scales for the rest of the state. Quad maps for the entire state are available at Bend Mapping & Blueprinting, Inc. for $5 each. Quad maps for national forests in Oregon and Washington are available at the Deschutes National Forest Supervisor's Office at $4 apiece. A map isn't much good if you don't know how to use it. Speik's tutoring class, "Wilderness Navigation: Map, Compass and GPS," costs $30 per person for a three-hour session for groups of two to five people. Speik can be reached at 385-0445. Why is the digital cell phone best for backcountry and mountaineering? Why are "Snow Caves" dangerous?